Born to the French nobility. Educated at Ferrières Abbey. Ado renounced his title and inheritence, and became a Benedictine monk at Ferrières. He taught at Prüm Abbey at the request of its abbot, but dissension among the brothers forced him to return home. Pilgrim to Rome, Italy for two years. He moved to Ravenna, Italy where he revised and published a version of the Roman Martyrology in 858. Pastor of Saint Romanus church at Lyon, appointed by the archbishop, Saint Remigius. Archbishop of Vienne, France in 859, appointed by Pope Saint Nicholas I. Noted reformer in his diocese. He wrote biographies of Saint Desiderius and Saint Theuderius, and a world history text. He opposed the efforts of Lothair II of Lorraine to put aside his wife, Theutberga, in favour of his mistress, and he led the effort to annul the synod of Metz's approval of Lothair's actions. 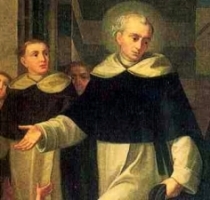 Joined the Dominicans in Brescia at age 15 in 1429, the youngest that he could, and spent the next 67 years as a zealous and reforming friar. Superior of several Dominican houses. Vicar of a reformed congregation of Lombardy. Known for his personal strict adherance to the rules, and his gentle ways with those who could not live so stricly. Died while en route to a convent for a mission. Born to the nobility, one of eleven children Count Fontenella of Santena, Italy. At age twelve she joined the Cistercians at Saluzzo, Italy. Unfortunately, Mary's father died soon after, and Mary had to return home to help with the family. Four years later, over the protests of her family, she joined the Carmelites in Turin, Italy. Visionary and mystic, she was the victim of numerous demonic attacks. Novice mistress in 1691 at age 33. Prioress in 1694. Founded a Carmelite monastery at Moncalieri, Italy. Noted for her strong devotion to Saint Joseph. Layman in the archdiocese of Thare and Nonseng, Thailand. Catechist in Songkhon in 1926. Married to Marie Thong in 1931. Father of five. When the parish priest was exiled during a persecution in Thailand, Filip took over leadership of the Christian community. He also protested the police harassment of Catholics; he was ordered to report to police headquarters in Mukdahan. On the way he was ambushed, tortured and murdered. One of the Seven Martyrs of Thailand. 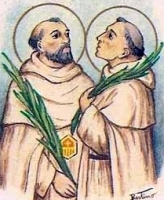 Three Mercedarian friars who, in 1314, went to Tunis, Tunisia in North Africa to free Christian captives. On the trip home, their ship was captured by pirates, and they were imprisoned. While in captivity he ministered to other prisoners and talked about Christ. His non-Christian jailers murdered him to stop it. Martyr. Priest in the archdiocese of Turin, Italy. Founded the Institute of the Daughters of Saint Joseph. Young Christian maiden martyred in the persecutions of Decius. Greeks maintain that her body was miraculously translated after death. Soldier. Knight. Fought in the recovery of Balearic Islands of Spain from the Saracens. Joined the Mercedarians on 10 August 1218, accepted into the Order by Saint Peter Nolasco. Known for his personal piety, virtue and devotion to the Order. Sixth century BC Old Testament prophet during the period after the exile. The message he brought concerned rebuilding the Temple in Jerusalem. Born to pious Portugese noble family. Poor Clare nun at Saint Clare Vila do Conde, diocese of Braga, Portutal. 10th-11th century bishop at Mortlach, Banff, Scotland, and Aberdeen, Scotland, appointed by Pope Benedict VIII. Founded a monastery on an island in Lough Derg, Donegal, Ireland, and served as its first abbot. Cistercian monk at Clairvaux Abbey in France. Abbot of Citeaux Abbey in 1133. Compiled the first collection of Cistercian statutes. Patriarch of Constantinople from 983. Son of Everardo, founder of Cysoing Abbey. Monk at Cysoing in the late 9th century. Bishop of Gaza in Palestine. A large group of women martyred in the persecutions of Hunneric, Arian King of the Vandals. A group of Christians martyred together. Four names and no other information has survived - Agricola, Concordius, Navalis and Valentine.